Does your PC support SLAT? 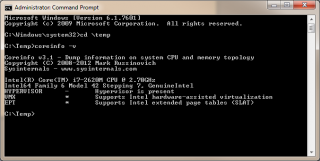 Download CoreInfo, & run the following command to dump only the virtualization-related features. If you have an Intel processor you need to look on the last line entitled EPT. If you see a star you are good to go, a dash or nothing – then new hardware will be required. On AMD processors you are looking for the last line entitled NP. Again, a star means your PC supports SLAT, a dash or nothing = you won’t be able to run the emulator.